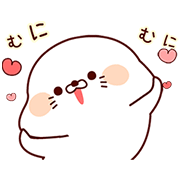 http://www.line-stickers.com/ – Animated Stinging Tongue Seal Stickers Line Sticker | If you’ve ever needed to be brutally honest about anything, count on these moving seal stickers to seal the deal. Cute to look at, but with words that sting, this submariner helps you say what needs to be said in a not-so-subtle way! Plus a guest appearance by an unbearable bear! If you’ve ever needed to be brutally honest about anything, count on these moving seal stickers to seal the deal. Cute to look at, but with words that sting, this submariner helps you say what needs to be said in a not-so-subtle way! Plus a guest appearance by an unbearable bear! Lou Oshiba: All Together Now!